Be aware of "leaves of three"
A poison oak rash is an allergic reaction that comes from contact with the poison oak plant. The skin rash is best known for the itching and swelling that accompanies contact with the plant. The poison oak plant generally has clusters of three leaflets and will bloom late in the spring season. Much like poison sumac and poison ivy, poison oak contains the chemical urushiol. Urushiol is an oil that causes multiple symptoms upon contact with the skin. Increased exposure to urushiol will result in a more severe reaction. Poison oak contains this oil in its leaves, flowers, roots, and berries, so any skin contact with this plant is likely to result in these symptoms. A poison oak rash can also be contracted through secondary contact with items that have had contact with the plant, such as clothing, pets, and sporting gear. Some individuals may be more sensitive to the poison oak allergen than others and may experience more severe symptoms. 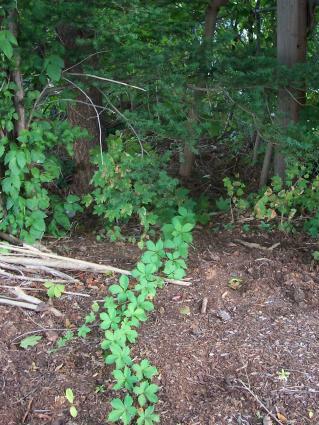 About 80 percent of all individuals who come into contact with poison oak will have an allergic reaction. It's important to note that this type of rash is an allergic reaction and is therefore not contagious. Onset of symptoms can vary widely, usually showing up on contacted areas an average of five hours to 48 hours after initial contact with poison oak, or secondary contact with a material that contains the tree's urushiol oil. However, first time exposure to the poison oak plant may show symptoms as late as 15 days after the initial touching of the plant. Symptoms appear far more quickly with repeated exposure. 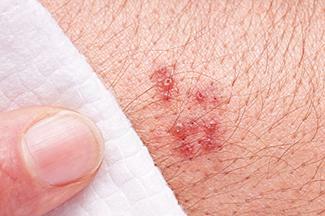 Most cases of poison oak rash can be treated at home. Once poison oak exposure is identified, the first thing to do is to wash the affected area with soap and water. In order to soothe the severe itching that accompanies these rashes, calamine lotion can be applied after first washing the area. Cold compresses and baths can also be used. Non-prescription antihistamines are also options for treating itching symptoms. Additionally, some individuals suggest certain home remedies, such as baking soda pastes, aloe vera, and the use of vinegars. More severe cases of the rash may need to be treated by a doctor. Common medical treatments involve corticosteroid cream, pills, and, in some cases, injections. If left untreated, a poison oak rash can last up to three weeks. For individuals with severe allergies to the urushiol oil, it could take up to six weeks to fully recover. The best way to prevent poison oak rash is to learn to identify the plant and avoid skin contact. This can be done by wearing long-sleeved shirts and pants when in places where the plant is commonly found. Be aware of what you touch with your hands when walking areas known to contain the plant. Also, if you believe that you have been in an area that contains poison oak, be sure to wash your clothing, since urushiol may have rubbed off on your clothes and pose the risk of contact with the allergen. A poison oak rash is a common allergic reaction to a plant found in many wooded areas and even near playgrounds or nature parks. All efforts should be made to learn to identify and avoid exposure. While the rash is uncomfortable, it is rarely dangerous and generally will heal with time and leave little, if any, scarring.